*Registration includes light breakfast, lunch, afternoon refreshments, and evening reception. Technology Development Envelope (TDE) is a new concept and methodology that links technology to business strategy so managers can understand where technologies are going in the future and how they will fit into their corporate strategy. The TDE model is based on technology forecasting, identification, assessment, evaluation, and selection. The result is presented as technology development paths. The path connecting technologies with the highest strategic value over the time is the optimum path, the one a company should follow. The path that a company selects to invest in can be referred to as a company’s “technology development roadmap.” Using TDE can help technology developers and implementers assure that their technology strategies fully support corporate goals and objectives. This short course will cover the step-by-step development of the TDE model, using several case examples to demonstrate how the TDE concept can be applied. Dr. Nathasit Gerdsri is an Assistant Professor and Program Chair of New Technology Venture in the College of Management at Mahidol University, Thailand. He is also a visiting faculty at Europa Institute of MBA in Germany. His primary research areas are focused on integrating the technology strategy into the business strategy. His research activities in this area are carried out through academic, training, and consulting projects with several organizations, and his research outputs have been published in a number of journals. Dr. Gerdsri has also worked with Intel Corp./R&D Lab located in Oregon (USA) as a technology developer and research program coordinator from 2001-2002. Dr. Gerdsri received his Ph.D. in Systems Science/Engineering and Technology Management from Portland State University (USA) in 2004. His Ph.D. dissertation was on the development of the technology development envelope (TDE) for roadmapping of emerging technologies. A part of his dissertation was selected for the PICMET '05 Outstanding Student Paper Award. He is also listed in Marquis Who’s Who in the World. Strategic management is the process of making the difficult choices that set the direction and create the future of an organization. Strategic management of R&D is about selecting the “best” set of R&D and technology projects to support the objectives of the organization and create maximum value. The participant will gain a comprehensive understanding of what R&D strategic management entails, the benefits of doing it well, and some of the major sub-processes methods needed to do it well. In particular, the modules on R&D project evaluation will spell out how to quantify the commercial value and technical and commercial risk of R&D projects, while the modules on portfolio management will cover the major tools and frameworks that enable effective R&D project prioritization and selection. All of the processes, frameworks and methods will be illustrated in the context of actual examples, some published and some (disguised) drawn from actual situations. Dr. Michael Menke is a Fellow of Knowledge Management at Decision Strategies Inc., assisting a wide range of companies with strategy, decision making and portfolio management. Formerly, he was the chief portfolio advocate for Hewlett-Packard (HP), advising executives and working teams at all levels and in all segments of HP on strategy development, decision making, portfolio management and new business creation. Before joining HP he was a founding partner of and led the R&D management practice at Strategic Decisions Group, a consultancy where many of the portfolio management approaches in use today by leading companies were initially developed. He has consulted with Alcoa, Amgen, AT&T, Bayer, Chevron, DuPont, Exxon, Ford, GlaxoSmithkline, HP, IBM, J&J, Kodak, Lilly, Mitsubishi, Novartis, Owens-Corning, Pfizer, Roche, Shell, Sumitomo Electric, Texas Instruments et al. on strategy, major decisions and/or portfolio management. He has been on the program committee for the IIR-PDMA portfolio conference for seven years, he is a founding member of the Enterprise Portfolio Management Council, co-chair of the IEEE standards working group on Strategic Enterprise Decision Management and has also been an invited speaker at dozens of international conferences on portfolio management, innovation, R&D/technology and business strategy, and decision making over the past 25 years. "2nd Generation Accelerated Radical Innovation"
The Accelerated Radical Innovation (ARI) Methodology is a conceptual framework and associated set of techniques and tools for dramatically reducing the unacceptable levels of time, cost, and risk that are associated with radical, breakthrough, or disruptive innovation, which typically takes anywhere from 10 to 60 years. The impetus for a comprehensive methodology for ARI emerged because innovation teams lack an integrated, holistic, multidisciplinary, and workable approach to accelerating breakthrough innovations. The majority of innovation methodologies developed to-date address incremental improvement and cost reduction for established products and processes. Most research on radical innovation historically has focused on case study assessment. An important recent breakthrough—the open innovation paradigm—builds on the advantages of horizontal collaboration among a variety of stakeholder organizations rather than vertical collaboration within a single organization. ARI takes open innovation to the next logical level by encompassing the entire life cycle of radical innovation, moving beyond collaboration to deliberately designed and actively managed innovation value networks, and capitalizing on 21st century real-time distributed competitive intelligence technology. The emerging discipline of ARI was launched in 2004 at international conferences of innovation scholars and practitioners in the USA and India. Developmental work led to the establishment of the International Accelerated Radical Innovation Institute (www.ari-institute.com) in 2005. 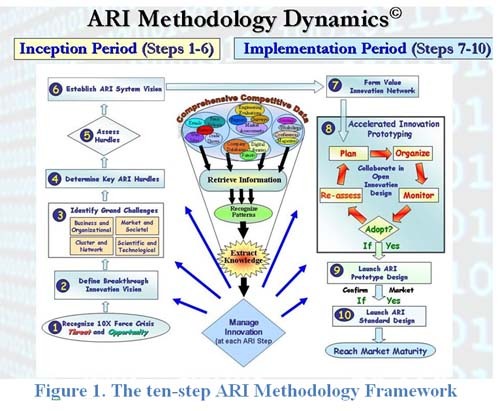 The ARI methodology was tested in 2006-2008 under a contract with the Health Innovation Partnership funded by the UK National Health Service. It was presented in several sessions at PICMET 2005 and 2007 and featured in a 2009 special issue of the journal Technology Forecasting and Social Change. It is currently in its second generation. The workshop introduces the rationale for ARI and its theoretical and empirical foundations. The majority of the workshop covers the methodology itself, beginning with the formulation of the initial breakthrough concept; proceeding through the analysis and planning stages; the construction of a business plan; the development of an innovation value network; prototyping; and the realization of a standard design, commercial launch, and market maturity (Figure 1). Tools and techniques are introduced, including the ten-attribute innovation scorecard for tracking progress and a suite of competitive intelligence tools. Participant Involvement: The workshop gives participants an opportunity to apply the ARI methodology to a promising recent radical innovation in cancer diagnosis and therapy through guided discussion and group exercises. Feedback from attendees on improvements and further applications of the ARI Methodology will be solicited, verbally and via a short questionnaire. Who should participate and what will they gain from the workshop? The workshop organizers are actively seeking industry partners to test the ARI methodology in their organizations. The workshop will familiarize functional executives in technology companies with the ARI methodology so that they can evaluate its applicability to their development projects. ARI itself is a work-in-progress. Scholars and students of the innovation process will have an opportunity to participate in reviewing the methodology and shaping its future course. The workshop organizers are actively seeking academic partners to form a scholarly community of ARI practice and research. Dr. John P. Dismukes is Professor of the Chemical and Environmental Engineering Department at the University of Toledo (USA) and Director of the International ARI Institute. An internationally recognized material scientist, he has held research positions at the RCA David Sarnoff Center and ExxonMobil’s Corporate Research Laboratories. He is the author of 82 technical papers, holds 12 patents, and is a Fellow of the Electrochemical Society. Since 2004, John is a co-founder and principal of the International Accelerated Radical Innovation Institute, where he has taken the lead in organizing conferences and workshops in the new field of Accelerated Radical Innovation. "Managing People, Technology and Innovation"
This workshop provides seasoned managers and project leaders with a forum for discussing best-in-class practices and contemporary concepts, tools and techniques for managing innovation under cost and time pressures in team-based environments. The emphasis is on people skills and leadership needed to produce innovative results. Working interactively, participants will discuss contemporary problems and challenges of managing in team-based environments and explore solutions for dealing with interruptions, risks, conflict and commitment in technology-based work environments such as R&D, new product, process and service developments. The workshop includes four specific topics, including two experience-sharing group exercises. Topics: (i) characteristics of an innovative work environment, (ii) measuring innovative performance, (iii) setting up an effective team environment, (iv) managing technology-based teams; Group Exercises: (v) Motivation and Leadership Style: Participants examine the motivational methods and leadership style most conducive for their technology-intensive work environments, determine the drivers and barriers of high team performance, and suggest actions for improving team effectiveness and performance; (vi) Work Environment and Process: Participants examine their (project) work environment, challenges, critical success factors, potential for improvement, and alternative leadership methods. Participants establish benchmarks and work out an action plan for improving their team environment and management systems. Dr. Hans J. Thamhain is a Professor of Management and Director of MOT and Project Management Programs at Bentley University, Boston/Waltham, USA. Dr. Thamhain held management positions with Verizon, General Electric and ITT, has written over 70 research papers and six professional reference books. He received the IEEE Engineering Manager Award in 2001, PMI’s Distinguished Contribution Award in 1998, and PMI’s Research Achievement Award in 2006. He is profiled in Marquis Who's Who in America and certified as a NPDP and PMP. Whether announcing a merger or introducing a new product, whether explaining design modifications or making employees aware of a re-organization, leaders in engineering and high tech have many opportunities to present to groups. Successful occasions depend on a presenter’s ability to be engaging, concise, tuned-in and (often) persuasive, but it is not easy to bring all that together. Susan de la Vergne helps engineering and high tech professionals meet leadership challenges—management and project management, presentation skills, sustaining teams and improving personal productivity. A writer, instructor and speaker, Susan’s well-researched material draws on her 25-year career in information technology management. She is the author of You CAN'T Manage Time—But You Can Manage Many Priorities. Her new book, Engineers on Stage! How to Create and Deliver Effective Technical Presentations, is due out in 2009. She is a member of the National Speakers Association. Technology managers operate in a fast-paced, rapidly changing and highly complex environment. Decisions about technology are among the most important faced by organizations – business, public and not-for profit. Knowledge of technology is essential to wealth generation, and forecasting of technology is critical to estimating the value of that knowledge. This PICMET short course presents a practical guide for making those decisions by providing methods for forecasting and analyzing the likely growth and consequences of emergent technologies. • Uses new techniques that exploit the abundance of digital sources of information. The fundamental challenge of technology forecasting is neither understanding the needs of decision-makers, nor applying any specific method in pursuit of the question. Instead, this new course will focus on the primary issue in technology forecasting: how to design a forecasting strategy that synthesizes diverse sorts of information and integrates insights from multiple forecasting methods. In this step-wise method for conducting analyses, each step is demonstrated using examples and discussion of the challenges involved. We also integrate our account of technology management problems with those presented by leading experts in the field. The course reflects the enormous power of information and communication technology that has dramatically improved the ability of even small organizations to collect and process information. Using vast new information resources, access to the internet and advances in strategic decision-making, the course shows how to analyze technologies rapidly and at reasonable costs with a concise description of methods and detailed guidance about the steps and stages of the technology forecasting project. It also uses case studies about applying technology forecasting to specific new developments to demonstrate the applicability of the tools it describes. The course will include a specific case study of nanotechnology in small- to medium-sized enterprises. Such cases are invaluable in demonstrating the real problems of integrating and synthesizing information in a forecast. We believe that current practice demands forecasting techniques that can be implemented using existing desktop software, and that draws upon the information resources available to a competitive organization. Finally, it shows how forecasting can be a practical component of technology management for both executives and the designers who make technology and business decisions as part of their day-to-day work. The course draws upon a revised draft of one of the original technology forecasting texts, Forecasting and Management of Technology, published by Wiley in 1991. Participants will be working with the newest ideas in the field; the revised book will not be available on the market until 2010. Dr. Scott Cunningham studied technology forecasting and technology assessment under Professors Alan Porter and Fred Rossini, at the Georgia Institute of Technology, developing a specialty in the field of digital intelligence. He completed his studies at the Science Policy Research Unit at the University of Sussex (D.Phil.1996), where he worked with Professor Ben Martin in the area of science policy and research evaluation. Dr. Cunningham spent seven years in industry, working in the field of knowledge discovery in databases. He worked with AT&T at the time of trivestiture, is an alumni of NCR's Human Interface Technology Center, and earned six U.S. and international patents for Teradata, maker of some of the world's largest data warehousing and business intelligence solutions. He was a founding engineer in several Silicon Valley business intelligence start-ups, including the company DemandTec (NASDAQ: DMAN). Currently, Dr. Cunningham is an assistant professor in the field of policy analysis, at the Faculty of Technology, Policy and Management at the Delft University of Technology. He has been an invited lecturer to the Harbin Institute of Technology, a top-ten Chinese university, as well as the Shell Project Academy, which is Shell's own project management academy. He has published multiple technical articles and book chapters on technology forecasting, including papers in the journal of Technological Forecasting and Social Change and Technology Analysis and Strategic Management. He is the co-author of two books on technology forecasting: the 2000 book Tech Mining with Alan Porter, and he is one of the authors of the forthcoming book Forecasting and Management of Technology, Second Edition. Motorola is widely credited with the original development of technology roadmapping in the late 1970s to align strategic product and technology plans. The approach has since been adopted (and adapted) by many organizations in a range of industries (for example, NASA, Boeing, GM, Honeywell, ABB and Arup), and also at the sector / national level (for example, US Department of Energy, Industry Canada and METI in Japan). Roadmaps can take many forms, but the common feature is the use of simple graphical frameworks to support the synthesis, alignment and communication of complex strategic issues. 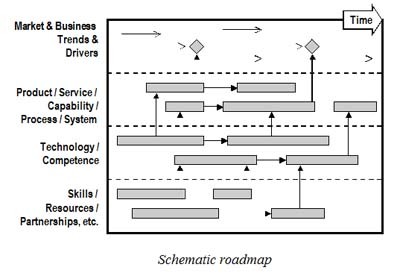 The roadmapping approach is flexible and can support many different strategic aims, where there is a need to align different functional strategies or organizational perspectives (for example, markets, products, services, technology and resources). While the dominant term is “technology” roadmapping (due to the historical roots of the approach), “strategic,’’ “innovation,” “business” or “industry” roadmapping are perhaps more appropriate given the potential uses of the method. Participants will be introduced to both the concept and application of roadmapping, including a combination of presentations, group activities and discussion. During the activities participants put the concepts into practice, using “fast-start” workshop methods developed by the Centre for Technology Management at the University of Cambridge. These enable organizations to rapidly initiate roadmapping, focusing on strategic issues of current concern in order to deliver immediate benefits in terms of communication, decisions and actions. The approach has been applied in a wide range of sectors, organization types and strategic contexts, including technology, product, service, business, corporate and sector level applications. • The history and development of roadmapping, from its firm-level origins for product-technology planning to government-level foresight activities. • Fast-start workshop methods for strategy and innovation, including the ‘S-Plan’ approach for business, corporate and sector applications, and ‘T-Plan’ for product-level innovation and strategy. • Case studies and examples to illustrate the application of roadmapping. • Consideration of how roadmapping integrates with other management processes and tools. • Implementation issues and success factors for initiating and sustaining roadmapping programs. • Strategic landscaping activity to share perspectives and to identify key topics for further exploration. • Topic roadmapping activity to explore key topics identified in the landscaping activity. • Product-technology roadmapping activity to develop an integrated product strategy. • Planning for roadmapping activity to apply the concepts to areas of interest to participants. Dr. Robert Phaal joined the Centre for Technology Management at the University of Cambridge in 1997, where he conducts research in the area of strategic technology management. Roadmapping is a particular interest, to support innovation and strategic planning, aligning commercial and technical perspectives. The focus has been on developing practical workshop-based methods for the rapid initiation of roadmapping, which have been applied in a wide range of organizations and sectors. Other research interests include technology emergence, intelligence and evaluation, together with the development and integration of management tools and processes for strategy and innovation. Dr. Phaal has a mechanical engineering background, with post-graduate degrees in applied and computational mechanics, and industrial experience in technical consulting, contract research and software development.